Birkirkara continued their investment in their first-team squad after announcing the signing of three overseas players, yesterday. In a statement, on their club website, the Stripes said that they had reached an agreement to re-sign Serbian striker Srdjan Dimitrov while they also offered a contract to Macedonian goalkeeper Kristijan Naumovski and Brazilian defender Fernando Barbosa Pereira. For Dimitrov this will be his second spell at Birkirkara and coach Paul Zammit will hope he can replicate the scintillating form he produced last season which saw him establish himself as one of the best overseas players in the top flight, scoring 10 goals in 36 appearances. The 25-year-old, who started this season at Latvian side FS Rigas, arrived in Malta a fortnight ago and immediately starting training with the Stripes first team squad. Naumovksi is a Macedonian international, having collected nine caps with the national team, and has signed a six-month contract. The towering goalkeeper played the last two seasons with Hong Kong Pesasus while he had also spells with FC Rabotnicki, Dinamo Bucharest and Levski Sofia. Barboso Pereira is a robust defender who was on the books of Portuguese side AD Nogueirense while this season he also played in Brazil with Alercim where he made six appearances. 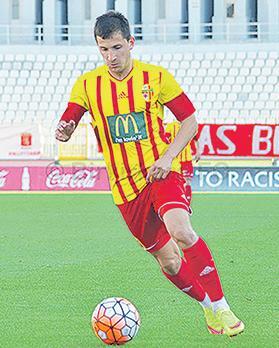 Dimitrov, Naumovski and Fernando are unlikely to be Birkirkara’s only signings during the winter transfer window as the Premier League side are planning to bring in two other overseas players in the coming weeks. Team manager Michael Valenzia confirmed to Times of Malta, that the Stripes have identified two strikers and are hopeful of wrapping up a deal in the first week of January. The new arrivals will inevitably spark a host of departures from The Valley club and in fact in the last two weeks the Stripes have released Cameroon striker Ernest Ern For and Brazilian forward Fabiano. Valenzia also brushed off rumours that there are currently talks undergoing between club president Frank Zarb and former Juventus administrator Luciano Moggi on a possible collaboration. “A lot of talk has been said in the last few weeks but what I can say is that there has not been any contact between Moggi and Birkirkara FC,” Valenzia said.